Illuminated by streetlights and passing cars, the cracks dividing the white surface of my bedroom wall are easily visible. The peaks and valleys cut paths through the drywall, differentiated by shades of grey and marked deeply down to uneven floorboards. Stubborn and crooked in their tracks, the large windows at my bedside breathe cool night air over my rustled covers and rattle their panes at the will of heavy winds. Searching the backs of my eyelids for sleep, I erase the room from my sight and fill my mind with the sounds of the night. Occasionally a drummer sits on the corner across the street from my building, but tonight I am free from his cyclic beats and dozing off to the intermingled baselines of top hits from the bars below. Shouts and yells punctuate the beats, peppered with the rattling and cracking of the radiator at the foot of my bed. Recently, as the nights have turned colder, our nights have been afforded five minute stretches of banging pipes. Sounding its disapproval, our ancient building rattles with frustration as it protests the war of hot and cold taking place within its thin walls. I’ve always enjoyed the nights when the more “mature” bar plays classic rock and 90’s music, just because it’s nice to have a little variety. Also because I know that some nights, as I shield myself with blankets, I will be breathing these songs for some time before I drift off into sleep. However, other nights I find myself slipping into bed and falling asleep in seconds; gently rocked, perhaps, by the melody of Like a G6. In all seriousness, as bad as my apartment sounds (and looks, to some – hi mom! ), I’m used to the noise and distraction. Just as the cracks show that it’s settled into the city, I have settled into it. P.S. Happy (late) birthday, P! More detailed instructions can be found at Bravetart! Prepare a baking sheet by oiling with butter or lining with parchment. In a large pot, bring the water to a boil with the vanilla bean and simmer for one minute. Remove the vanilla bean (squeezing out any vanilla-y water from the inside) and add the vanilla seeds, sugar, corn syrup, and butter or oil to the pot. Turn the heat to medium-high and stir until the butter is melted and sugar is dissolved. Cook until the sugar is a dark amber color, being careful not to burn. Remove from heat and quickly stir in the salt and baking soda. Be careful because these additions will cause the caramel to bubble. Quickly add in the popped popcorn and stir quickly and carefully until the kernels are evenly coated. If you like your caramel corn clumpy, let it cool, as is. For individual pieces, separate kernels with your spatula. After the mixture is cool to the touch, (be patient or you’ll burn yourself – I know! ), you can use your hands to keep breaking up the clumps. Preheat the oven to 400F and set a rack in the middle. Lightly grease and line an 8×8 pan. Set aside. Weigh the bowl you plan to make the genoise in and write down the number. Whisk the eggs, egg yolks, vanilla, salt, nutmeg, cinnamon and sugar together in a large bowl over a pan of simmering water. Whisk until the mixture is warm to the touch. 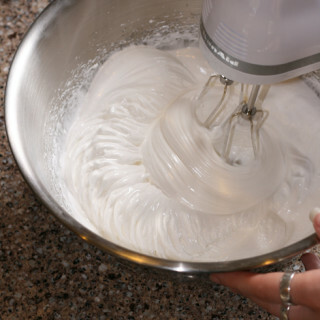 Transfer the mixture to the bowl of a stand mixer fitter with the whisk attachment (or hand held beaters) and whip on medium-high speed until the egg mixture is cooled and tripled in volume. 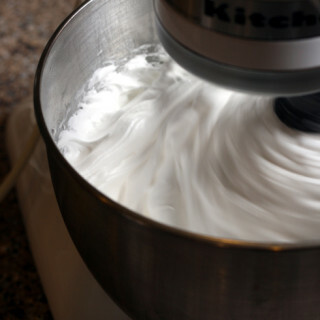 The mixture will be thick and will form a slowly dissolving ribbon falling back onto the bowl when the whisk is lifted. Over a medium bowl or a piece of parchment paper, sift together the flour and cornstarch. Add one-third of the flour mixture to the beaten egg mixture. 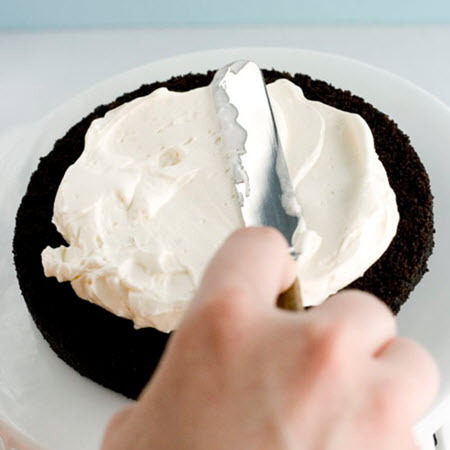 Use a rubber spatula to fold and making sure to scrape all the way to the bottom of the bowl. Repeat with another third and then add the final portion. Weigh the bowl and batter, then subtract the weight of the bowl from the number. Divide by 4, and pour that amount of batter (1/4th) into your prepared pan. 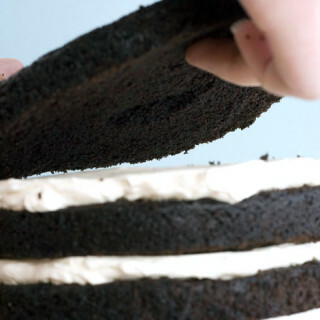 Smooth the top with an offset spatula and bake for about 10 to 12 minutes. Let cool on a rack for 10 minutes then invert onto a sheet of parchment paper and set aside. Repeat 3 more times so you have 4 layers. In a small saucepan, cook all ingredients until the sugar is dissolved. Let cool to room temp. Cook the sugar and water in a small, heavy-bottomed pan with the lid on until dissolved. Remove the lid and, without stirring, cook until dark amber. Remove from heat and add the butter, stirring constantly, then carefully pour in the cream (caramel will bubble violently!). Pour into a heat proof container to cool before using for mousse. In a small bowl, sprinkle the gelatin over the water and let stand to bloom while you prepare the cream. In a large bowl, whisk the egg yolks with the sugar until pale and lightened. Meanwhile, in a saucepan set over medium heat, bring the milk to a simmer. Slowly pour the milk over the yolks to temper, whisking constantly to prevent them from curdling. Pour the mixture back into the saucepan over medium low heat and cook, stirring constantly, until the cream coats the back of a spoon. Add the gelatin and stir until completely melted. Let cool to room temperature. 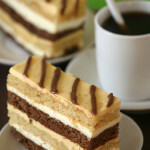 In a stand mixer fitted with the whisk attachment, whip the cream to soft peaks on medium speed and fold it, along with the caramel, into the cooled cream base. Use within one hour. 1/2 c (125 ml) apple butter, store-bought or homemade. Use the same method as above, folding in the apple butter in place of the caramel. Line an 8×8 baking pan with parchment paper or foil, leaving a lengthy border on the sides to facilitate removal. 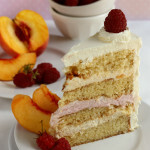 Place one layer of genoise at the bottom of the pan and brush with some the simple syrup. Pour half of the apple bavarian cream over the top and smooth with an offset spatula. 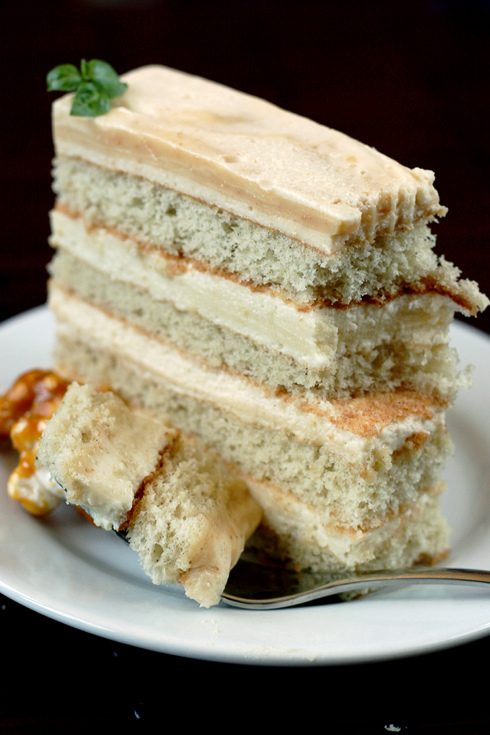 Top with another layer of genoise, brush with more syrup and pour half the caramel mousse on top. 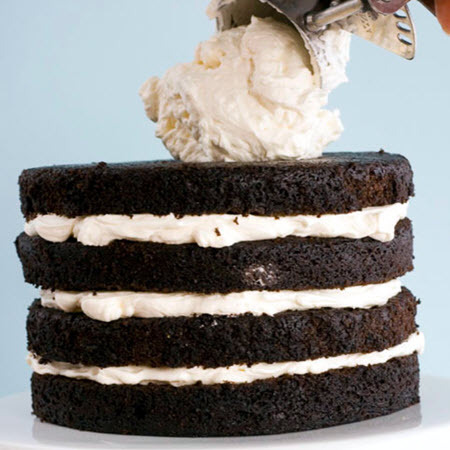 Smooth and repeat the process with the second half of cakes and creams. Refrigerate until set. 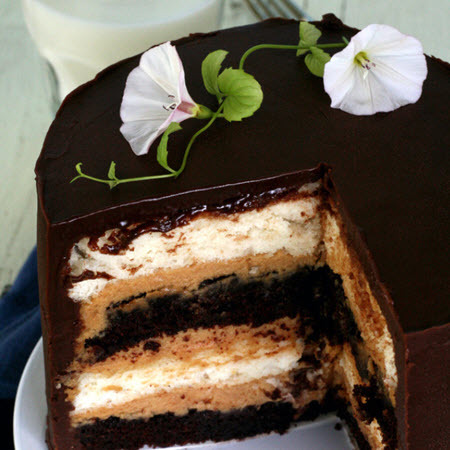 Was never a big fan or Caramel, but this looks exquisite. In the directions for the Caramel Corn, it says to add &quot;vanilla seeds&quot; – I might just be ignorant but are there such things? And they&#39;re not listed in the ingredients….the reason I ask is because I&#39;d love to try out the recipe, it looks delicious! Kaitlin, it looks so beautiful! The layering is so perfectly even, you must have a terrifically steady hand. I&#39;m so glad you&#39;ve made the caramel corn, it&#39;s genius to use it as a crunchy garnish! Perfect! wonderful writing… I could read your style for hours… very descriptive and stylish, much like your cooking… great layering! Wow, this is a stunning dessert. Sounds delicious, but the presentation is spectacular. 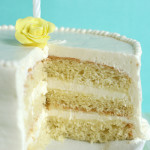 I almost stretched my arm to the screen to pick up your cake! 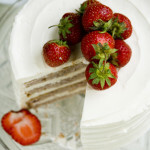 Gorgeous cake! Me? I&#39;m all for hustle and bustle – I can fall asleep in the middle of a maddening crowd (if tired enough) – looks like you are settling in nicely in your new digs! 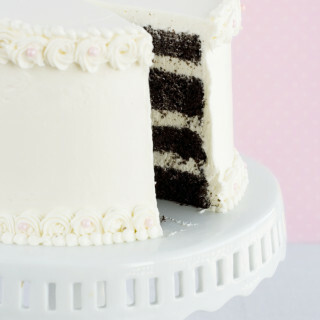 Beautiful layering on the cake! Wow this looks crazy! Can&#39;t say I&#39;d ever sign up for that much work, but you do have me thinking about using caramel as a flavor – especially now that it&#39;s fall/winter! oh wow this looks gorgeous and i love the side of caramel popcorn! Right now with an infant I could sleep anytime! I&#39;ve usually been an easy sleeper.<br /><br />This cake is amazing. 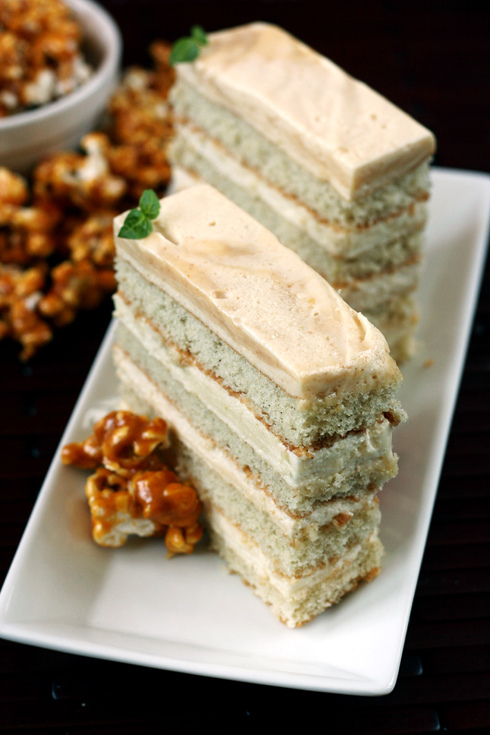 Love the creativity of corn and caramel! Love this, I&#39;m huge fan of apple and this is a great way to incorporate it in a dessert. I&#39;m bookmarking this recipe to try it. Oh my oh my oh my! This looks awesome!! How you are able to do all this AND be in school is truly amazing. 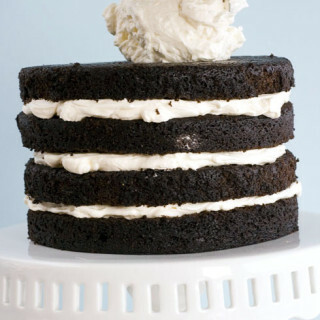 I just made the cake… but it looks nothing like yours 🙁 The cake ingredient list indicates and eggy cake, which is how mine turned out, but how does yours look like a cake that has butter in it? Thanks, guys!<br /><br /><b>Lady J</b>, I am so happy you liked it!<br /><br /><b>Ponyo</b>, I&#39;m not sure what to tell you. This is the recipe I used. I hope you&#39;ll like it anyway. How would I change the ingredients if I&#39;m going to use a 13×9 pan? I just used the same ingredients, and cut it to size. Kaitlin!<br /><br />Thanks for the recipe, it turned out pretty well :)<br /><br />Here&#39;s a link: http://www.ironwhisk.com/2012/02/caramel-apple-mousse-cake-popcorn/<br /><br />By the way, I think you forgot to add in instructions for when to add in the nutmeg and cinnamon in your recipe.<br /><br />Thanks again! It looks great! I&#39;m so glad you tried it :)<br /><br />And thanks so much for letting me know about the recipe SNAFU. I&#39;ll fix that right now!